A snap, loud and cracking, ricochets in the woods. “Are you sure?” The echo of the sound still rings in my ears. I stand stiff, straining for any sound. Night creatures sing, filling the night air, but theirs are the normal sounds of summer. Crickets and toads aren’t big enough to crunch things in the forest. Warmth fills my quivering chest, easing my tense shoulders. I’m being silly. It’s been a long day. Between Jack, his burn, and that creepy letter, I must be going nuts. I start down the path again, passing sedge brooms and saw palmettos. As crazy as the day has been, I don’t want the night to end. Maybe I can get Cooper to stay awhile, watch a movie or something. It’s not like he’s dying to get back home to hang with Missy and Beau in the hot tub. Another snap, sharper than the first, slices the night. My pulse charges. Cooper and I freeze. The night critters suddenly stop mid-song, leaving a heavy silence in the sultry air. My heart threatens to leap from my chest. Dead leaves rustle just a few feet away. It’s right behind us. Forgetting to breathe, I sink my nails into Cooper’s arm. Together, we pivot on our heels. Two enormous, glowing yellow eyes flash in the pitch black. Cooper snatches my hand and bolts down the path, dragging me behind him. Twigs break and crack in the woods behind us. Heavy, quick footsteps pound. Whatever it is, it’s keeping pace, following us. “Run faster!” Cooper yells and tugs on my hand, navigating us around the thick roots that cut across the path. I try to keep up, but my flip-flops and flapping bandage trip me up, and my short legs struggle to match Cooper’s long stride. The footfalls gain speed and draw closer. “Not fast enough! Come on, dig in!” He yanks hard on my hand and flings me in front of him, launching me farther down the path. Still running, I gape. He has taken my place, wedged himself between me and whatever is out there. “GO!” he yells, and I do, tapping into an unknown reserve of adrenaline, speeding toward the caretaker’s cottage. Lea Nolan writes the kinds of stories she sought as a teen—smart paranormals with bright heroines, crazy-hot heroes, diabolical plot twists, plus a dose of magic, a draft of romance, and a sprinkle of history. 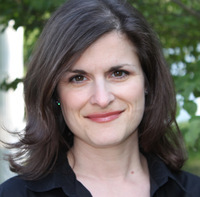 She’s holds degrees in history and women’s studies concentrating in public policy and spent fifteen years as a health policy analyst and researcher. She lives in Maryland with her heroically supportive husband and three clever children. 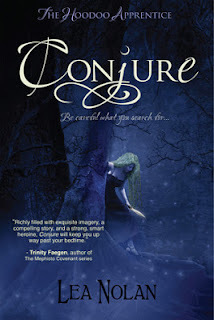 Her debut YA novel, CONJURE, book one in The Hoodoo Apprentice Series is a new release from Entangled Publishing under the Entangled Teen imprint. You can learn more about Lea on her website, on Facebook, Twitter and on Goodreads. CONJURE is available at both Barnes and Noble and Amazon. We have a copy of Conjure to share with one lucky commenter. Just leave a comment below with your e-mail address. Contest ends one week from today. Wow best giveaway!! Thank you so much! I loved the excerpt. I'm really looking forward to reading this book. Thanks for the giveaway! Great excerpt! Thank you sp much for the giveaway. These excerpts drive me crazy. I want to read the rest NOW! That is an awesome excerpt!! Looks like an excellent book! Can't wait to check it out! I try not to read excerpts because I feel like it'll give away the book. but gosh, I want to read this bad! And beautiful cover too! I love the cover of this book! I like the excerpt too! Sounds intriquing! Thanks for the chance. Can't wait to read this book! This is a great blog. Sounds really good!! Thanks for the excerpt and the chance to win! I like the idea of learning more about Hoodoo actually. This sounds really good. I love the demon dogs! This looks to be an original awesome book! Thanks. Excerpt = mass craziness!!! I don't really like reading excerpts (especially high-speed chases) because I feel like I'm out of place with the book, and need some context! But of course, that just makes me wants to read the book even more (ah, I see what you're doing there... lol). Thanks for the giveaway!!!! Conjure sounds like a fantastic story and I'm looking forward to reading it. I have been wanting to read this badly. Wow, excerpt has me wanting to read Conjure even more than before! I need to get a copy very very soon! It looks like a great book.